UPDATED: Mon., March 26, 2018, 8:38 p.m.
PULLMAN – Washington State basketball fans may have seen Robert Franks’ last game in a Cougar uniform. Franks, a 6-8 junior who was awarded the Pac-12’s Most Improved Player honor in 2018 after nearly tripling his scoring average, announced on Monday he will enter the 2018 NBA Draft. Franks is entering the Draft without an agent, according to a Twitter post, but says he intends to sign one. Players who hire an agent aren’t afforded the option to return to school, even in the event that they go undrafted, meaning Franks will preserve his college eligibility until he does so. As long as Franks doesn’t hire an agent before June 11, he’ll have until that date to decide whether he wants to turn pro or return to WSU for a senior season. By submitting his name for the Draft, Franks will have an opportunity to receive an invitation to the NBA Combine (May 16-20) and work out privately for NBA teams. The feedback he receives from NBA coaches and executives monitoring those workouts could help Franks make his decision. With his 17.4 points per game, Franks accounted for nearly one-third of the scoring Washington State got from its starting five and was the Pac-12’s seventh-best individual scorer in 2017-18. He nearly tripled his scoring average from 2016-17, bumping his 6.3 ppg to 17.4 ppg, and essentially doubled his rebounding average, from 3.3 rpg to 6.3 rpg. He also benefited from a boost in minutes, starting in all 30 games he appeared in and averaging 33 minutes per game after logging 16.4 per game as a sophomore. NBA teams could be intrigued by Franks’ combination of shooting and size. A 6-foot-7, 240-pound forward with a long wingspan, Franks was one of the Pac-12’s most accurate 3-point shooters as a junior, finishing 10th in the conference with a 40.5 percent clip. He ranked ninth in the league with 66 3-point makes. That’s also an area he honed between his sophomore and junior seasons. Franks shot the 3-pointer at a 30 percent mark last season. He also shot a cleaner percentage from the free throw line – 85 percent as a junior opposed to 73 percent as a sophomore. Franks isn’t currently listed on any major NBA Mock Draft board and didn’t have the opportunity to raise his profile by playing in the postseason. 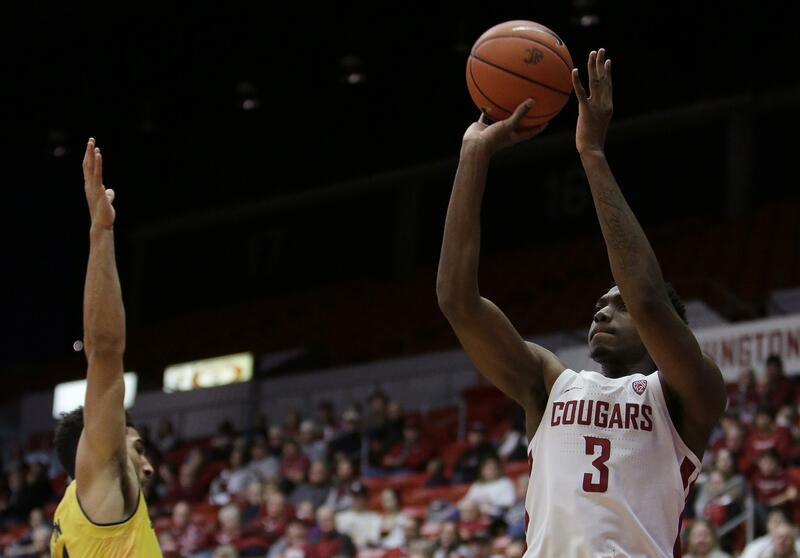 WSU’s season ended in the first round of the Pac-12 Tournament with a 64-62 overtime loss to Oregon. Franks scored 16 points in the game, on 6-of-11 shooting, but also committed four turnovers. WSU coach Ernie Kent encouraged Franks to explore that option and test the NBA waters, which underclassmen are permitted to do without hiring an agent. Franks’ exit would leave the Cougars with three returning starters for next season: Malachi Flynn, Viont’e Daniels and Carter Skaggs. Flynn and Daniels each started in at least 30 games, while Skaggs started in 11. Returners Kwinton Hinson and Milan Acquaah each made nine starts. The departure would also give Kent another scholarship to fill. Currently, the Cougars only have only one player signed in the class of 2018, C.J. Elleby of Cleveland High in Seattle. Published: March 26, 2018, 2:55 p.m. Updated: March 26, 2018, 8:38 p.m.